Since 2014, the City has dedicated significant funding for legal assistance for tenants facing eviction and harassment, increasing overall investment 17-fold from $6 million in 2013 to over $104 million in 2019. The city’s Universal Access program is the nation’s first and largest initiative of its kind. 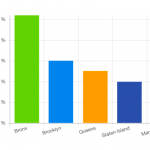 The Bronx has the highest rate of evictions. Brooklyn also experiences a lot of evictions but the borough has a high number of residential units, so the rate of eviction is lower. 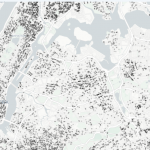 The residential evictions map offers eight layers that can be filtered by zip code and more. 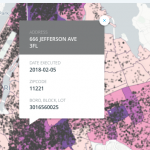 The map’s right side panel allows you to see evictions by year, zip code, or various types of districts (information shown on the right side panel corresponds only the subset of data shown in the current map view). In 2013, only 6,500 households representing 23,000 individuals had city-funded legal services. 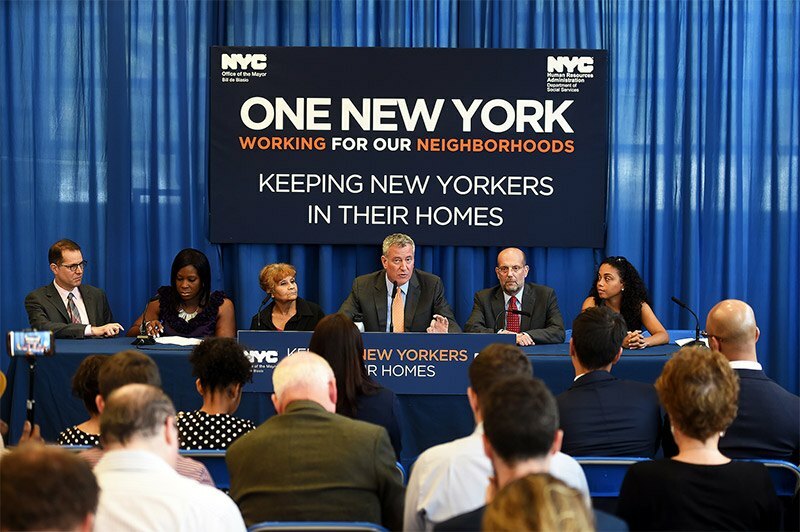 Through the Universal Access initiative, 400,000 New Yorkers facing eviction are expected to receive legal assistance annually when the program is fully implemented in 2022, with annual funding for legal services for tenants increasing to $155 million. The first phase of Universal Access included increasing access to free legal representation in Housing Court to low-income New Yorkers in fifteen zip codes across New York City that were identified as having high levels of eviction filings, shelter entry, and rent regulated housing. During the second phase other high risk zip codes were added for a total of twenty zip codes across the city. 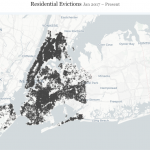 “This latest decline in the number of evictions demonstrates that the administration’s comprehensive, multi-pronged approach to protecting tenants is paying off,” said Housing Preservation and Development Commissioner Maria Torres-Springer. 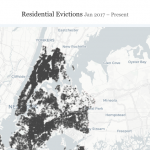 “These latest eviction numbers confirm what we already know — when tenants are given a fair chance to fight in housing court, they will win,”said Council Member Mark Levine, who sponsored of the City’s landmark Universal Access to Counsel Law. 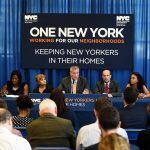 “The first step in both stemming the tide of homelessness and combatting New York City’s affordable housing crisis is to make sure that those who have homes can stay in them,” said Manhattan Borough President Gale A. Brewer. For legal help in fighting eviction, call 311 or visit the city’s Office of Civil Justice website.